Just once a month, the gods come together to bless us with a carbalicious night of delicious food. 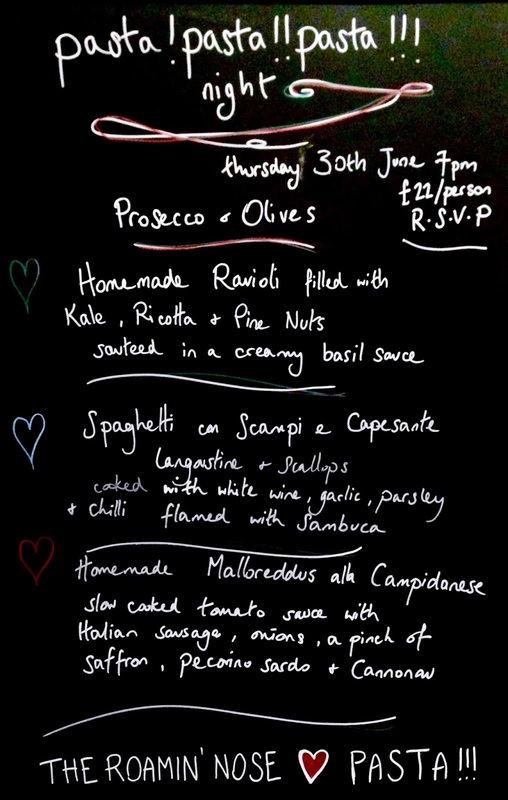 The Roamin' Nose in Stockbridge have invented the most genius night for the pasta lovers of Edinburgh and boy are we grateful. So I stumbled upon this little gem while walking to Stockbridge to get my locally produced ingredients for dinner at the market, and it made me very glad that I hadn't just opted for the lazy supermarket option. The 'PASTA! PASTA!! PASTA!!! night' sign obviously caught my attention and I was very pleased to find that the tickets were only £22 pp which included a glass of prosecco on arrival, a starter of bread/olives/oil etc (which was topped up throughout the meal) and three very different, delicious courses of pasta, all freshly homemade on the night. The first of which was a Malloreddus alla Campidanese - slow cooked tomato sauce with Italian sausage, onions and a pinch of saffron, pecorino sardo and cannonau. The thought of three courses of pasta was slightly intimidating until I saw the perfectly sized portion of the first course. The second was Ravioli filled with kale, ricotta and pine nuts, sauteed in a creamy basil sauce. After a short but well needed break, we were served Spaghetti with scampi, capesante langoustine and scallops cooked with white wine, garlic, parsley and chilli, flamed in samba. I can honestly say that they were some of the best pasta dishes that I have ever tasted. This was accompanied by excellent service, friendly and knowledgeable staff, and a great atmosphere. The little details such as mint in the table water and homemade petit fours at the end, all added up to make it an amazing evening and something a bit different and special for anyone who enjoys their carbs! The restaurant had a real Italian feeling to it, which instantly relaxed me. As each course was brought out to all of the tables at the same time it almost felt as thought it was a big family gathering (excluding the fact that we didn't actually know anyone). As this only takes place once a month with just one sitting of around 25 people on the night, there was a feeling of exclusivity that really added to our enjoyment of the evening.